I am a regular reader of Trak.in. It is an excellent website to keep track of all business and technology news in India. 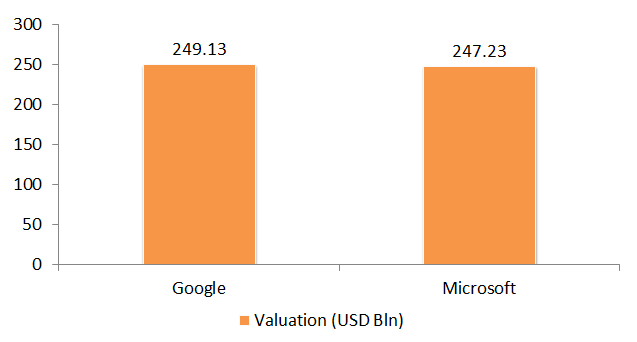 They have carried this news today: Google beats Microsoft to Become World's 2nd Most Valued Tech Company. If you read the news you will come across a chart. 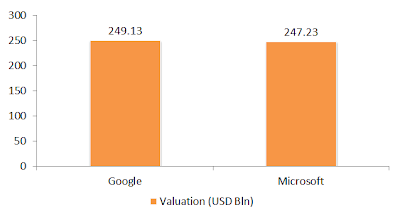 A simple bar graph which compares the market valuation of these two companies. At first, I did not see it coming. Then something stuck me. Looking at the chart, it really looks like Google has surged ahead. You see the gap between the height of Google's bar versus Microsoft's bar. Now read the figures. 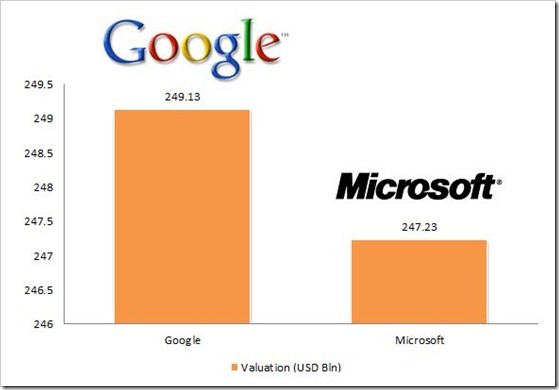 Google is 249.13 and Microsoft is 247.23. Just a difference of 2 points on the chart. No fun any more, right? As a rule, the axis must start from zero. Otherwise, you are not being fair to your audience. Whose responsibility is it to ensure the axis starts from zero? It is of the presenter. You are making the presentation and you need to stop manipulating the audience opinion (whether knowingly or by mistake). Microsoft is also responsible for these mistakes/errors. How? Open MS PowerPoint 2010 and insert chart. Feed in the numbers 249.13 and 247.23 and see the output. The chart produced by PowerPoint is the same as what Trak.in have published. The software automatically starts the axis at 246. How to change the axis to 0? Left click on the Y-axis. Then right click and choose Format Axis. Under Axis Options, go to Minimum. Select Fixed and set it to 0. You are done! As a presenter, always set the Y-axis to 0. In an exceptional case, when you cannot then let the audience know the axis does not start at 0. Resist the temptation to manipulate. To read more on how Statistics can fool people, read this old post of mine. About Trak.in. Well it's an excellent site and you must subscribe to stay up-to-date with all the business news.